The pottery is hand painted on a wheel while the clay is still soft. Etched designs are then made using fine carving tools on either red terra cotta or white clay. After the piece has been fired, the resulting designs will clearly and permanently show through. 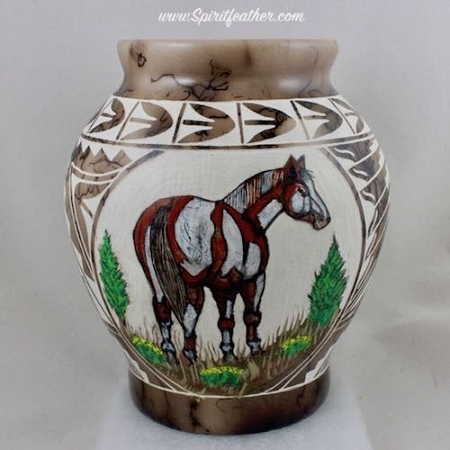 Horse hair pottery has an additional challenging step in which hair from the tail and main of a horse are sprinkled on the piece at just the right moment so that the hair will burn into the pot as black lines that give each a unique and unrepeatable design. It is said that this pottery was first created when a long-haired maiden was removing hot pottery from her kiln and the wind blew her hair onto the hot pot and burned the hair into the pottery.